WASHINGTON, Jan. 7 (Xinhua) -- The White House said Monday that U.S. President Donald Trump plans to visit the U.S.-Mexico border on Thursday, as the partisan fight over his demand for funding a border wall has left the federal government partially shut down for more than two weeks. "President @realDonaldTrump will travel to the Southern border on Thursday to meet with those on the frontlines of the national security and humanitarian crisis. More details will be announced soon," White House Press Secretary Sarah Sanders tweeted Monday, without elaborating on specific arrangements for the presidential trip. Shortly after Sanders' tweet, Trump took to Twitter to announce his Tuesday primetime speech on border security. "I am pleased to inform you that I will Address the Nation on the Humanitarian and National Security crisis on our Southern Border. Tuesday night at 9:00 P.M. Eastern," he said. The trip will be the first time Trump leaves the capital since the partial government shutdown took effect on Dec. 22. Trump has demanded for 5.6 billion dollars in the 2019 budget for building a wall along the border with Mexico to keep out what he said are illegal migrants and drug traffickers. 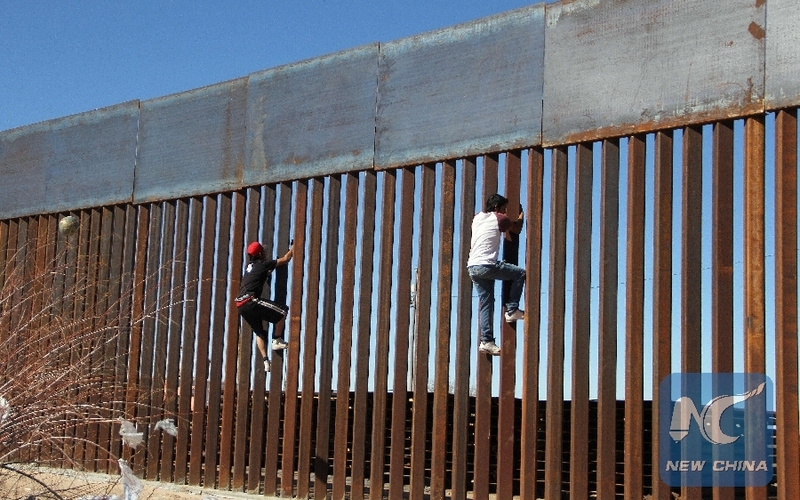 Congressional Democrats, while saying they are also committed to strengthening border security, view the wall as both immoral and ineffective. "A wall is an immorality, it's not who we are as a nation... We are not doing a wall," House Speaker Nancy Pelosi told reporters Thursday, when she assumed speakership. Trump said on Sunday that he expects "some serious talks" over the wall from Monday to Wednesday but continued to reject giving up his request for the funding. "There's not going to be any bend right here," he said. It seems that the only change he has made so far concerning the issue is the wording. He told reporters Sunday that he had asked his aides to switch to the term "steel barrier." "The Democrats don't like concrete, so we'll give them steel," he said. The president also suggested that he would declare a national emergency so as to use the money from the Department of Defense to build the wall, thus bypassing the Congress. Democrats said he might face legal challenges if doing so. In a tweet he sent on Monday, Trump partially cited Democratic Congressman Adam Smith as saying "Yes, there is a provision in law that says a president can declare an emergency. It's been done a number of times." "In this case, I think the president would be wide open to a court challenge saying, 'Where is the emergency?' You have to establish that in order to do this," Smith said. "But beyond that, this would be a terrible use of Department of Defense dollars."